BOERUM HILL — A community garden on Bergen Street has recently taken on a project to grow plants used to produce natural dyes for fabric, said a founder of the garden. This fall, Feedback Farms, a community-led garden located on Bergen Street between Third and Fourth Avenues, is working with the Textile Arts Center’s Sewing Seeds program to grow plants that can be used to produce at least 20 different colored dyes, said Clare Sullivan, a founder of Feedback Farms. Beginning its first season, which runs through November, the dye plants are distributed through Sewing Seeds’ Community Supported Agriculture (CSA) program, which provides its CSA members with the plants, as well as recipes and workshops that teach members how to create the dyes. 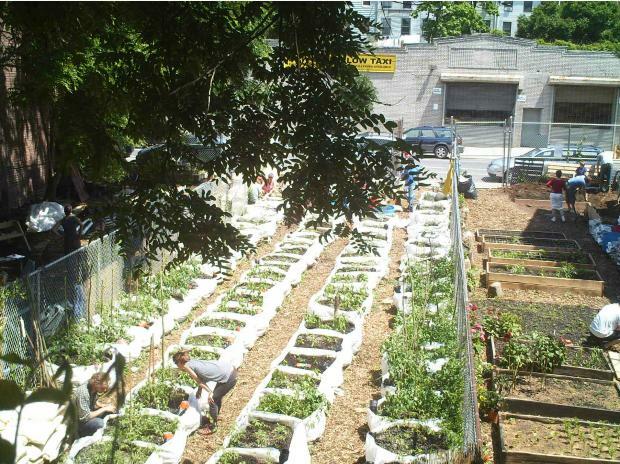 Last year, Feedback Farms identified three empty lots on Bergen Street to be used for a temporary garden space. The city owns two of the lots and one belonged to a private owner. “The lots were accumulating so much trash, and no one was managing it,” said Sullivan. The owner of the private lot gave Feedback farms permission to use the space under the provision that all installations were temporary, explained Sullivan. To accommodate, the group used portable beds and coffee sacks to grow their plants. Now, the farm is flourishing with annual vegetables, including butternut squash, cucumbers, tomatoes and kale. The garden, which is sliced into three parts by chain-link fences, is used by members of the community, the Textile Arts Center, and St. Lydia’s Church, located at 505 Carroll St.
“St. Lydia’s Church uses the front section to grow produce for their weekly meals, and they often give out their produce to their members,” said Sullivan. Since the garden’s start in January, the farm has hosted a variety of programs including, a concert, flower drying, and a farmer’s market. For more information, visit www.feedbackfarms.com.